Imagine a celebration that depends on cold weather, ice sculptors and hardy musicians. Think of a city better known for fractious politicians and scandal. Envision tens of thousands of people bundled up in winter clothes and partying in the streets and parks. Picture all this and you have Canada’s famous Winterlude in the National Capital Region of Ottawa/ Hull. Rideau Canal Skateway with Chateau Laurier. Over the course of three weekends in February, people in and around the city of Ottawa shake off the winter blahs to come together for a festival. Perhaps it’s a Canadian thing, to want to not just embrace the frigid winter weather but to celebrate it—and celebrate it they do. Music, skating and ice carvings all contribute to an outdoor festival that has to be experienced to be believed. Rideau Canal Skateway with Aboriginal Display. The creation of the National Capital Commission, Winterlude will mark its 32nd anniversary in 2010. From its success as a regional festival, it has grown to become a tradition in the area and cause for an annual pilgrimage for families from the Ottawa Valley, across Canada and around the world, attracting over 600,000 visitors during the 16 days of events. The centrepiece of the event is the Rideau Canal, the UNESCO World Heritage Site, now entering its 40th year as a public skateway. In 2009 I watched the Winterlude opening ceremonies taking place on a stage extending out over the frozen canal. Here Her Excellency, The Right Honourable Michaëlle Jean, Governor General of Canada, opened the event while crowds of people wearing ice skates looked on. Only in Canada! 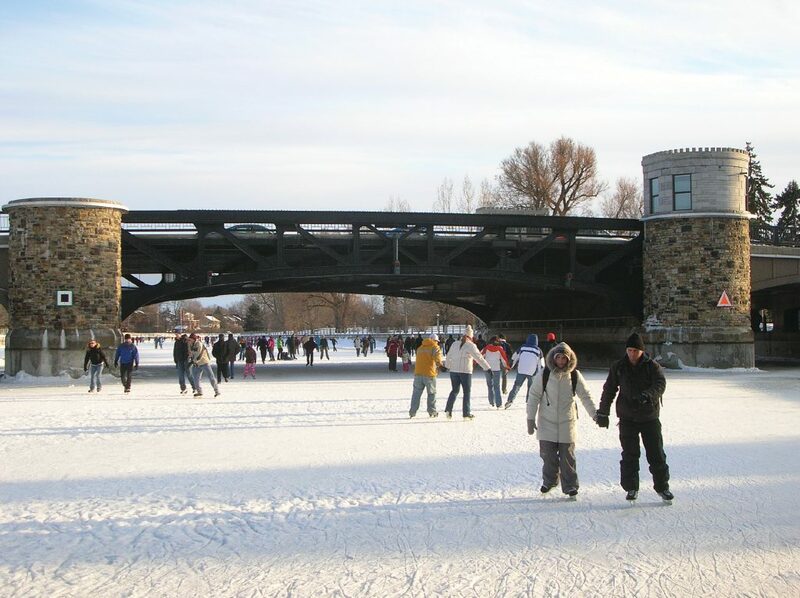 The Rideau Canal skateway is formed by first dropping the water in the canal to a very shallow depth. As it freezes, workers clear any snow off the surface and flood it with water to create what Ottawa claims is the largest skating rink in the world. The skateway stretches from the venerable Chateau Laurier Hotel almost eight kilometres to Dows Lake. 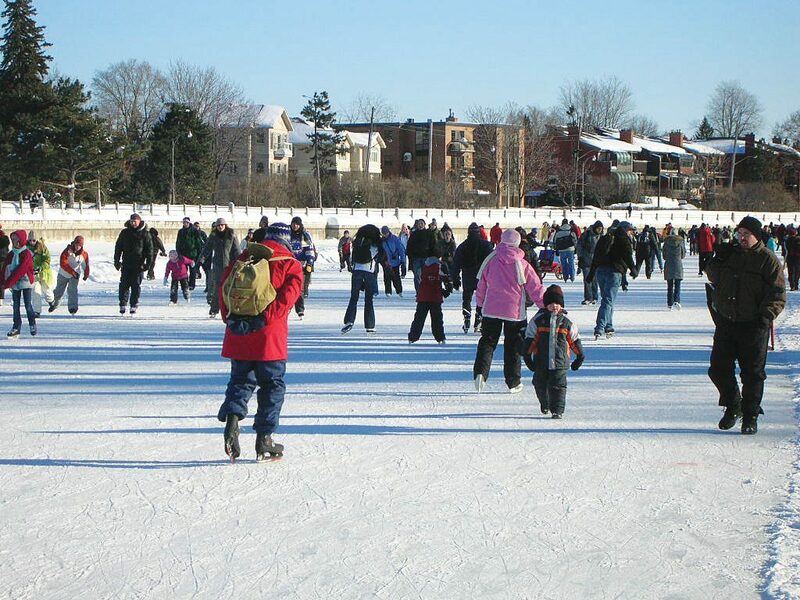 Thousands of people at a time can be seen skating on the canal or being pulled or pushed in all manner of sleds and sleighs. 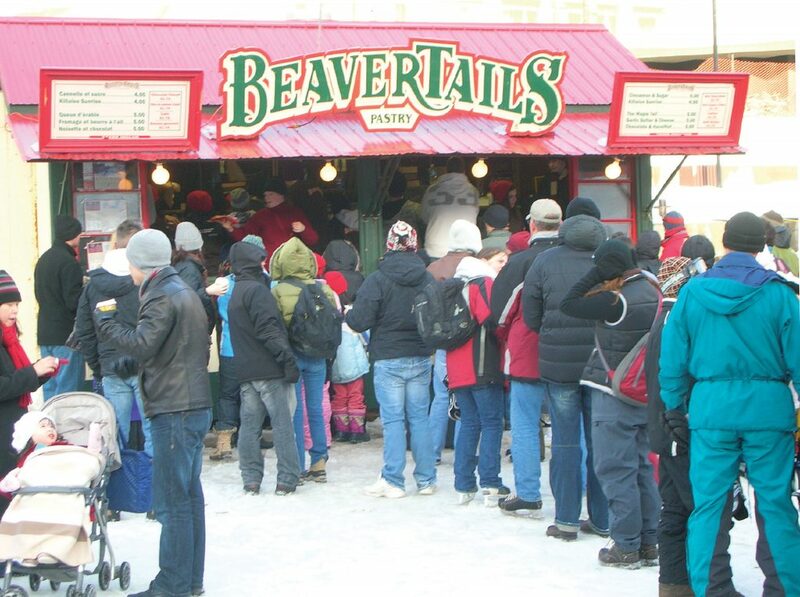 Along the route, shacks are placed to serve as warm retreats for lacing up your skates, as washrooms and as concessions serving hot chocolate or apple cider, maple syrup hardened on the surface of the snow and the ever-popular BeaverTails. The latter is a whole wheat pastry served hot and formed in a wide, long shape that looks like the tail of that national symbol. Topped with a choice of lemon, sugar, fruit, cinnamon, or in combination, it is served on a napkin and eaten quickly with your hands before it gets cold. Now in its 30th year on the canal, this enterprise has taken its secret family recipe to 88 locations across the country, including setting up shop in Whistler, BC, principal site of the 2010 Winter Olympics. How good are they? Well, U.S. President Obama made an unscheduled stop for one on his first visit to Ottawa. Besides the family-oriented fun of the canal, there are some popular Winterlude races. 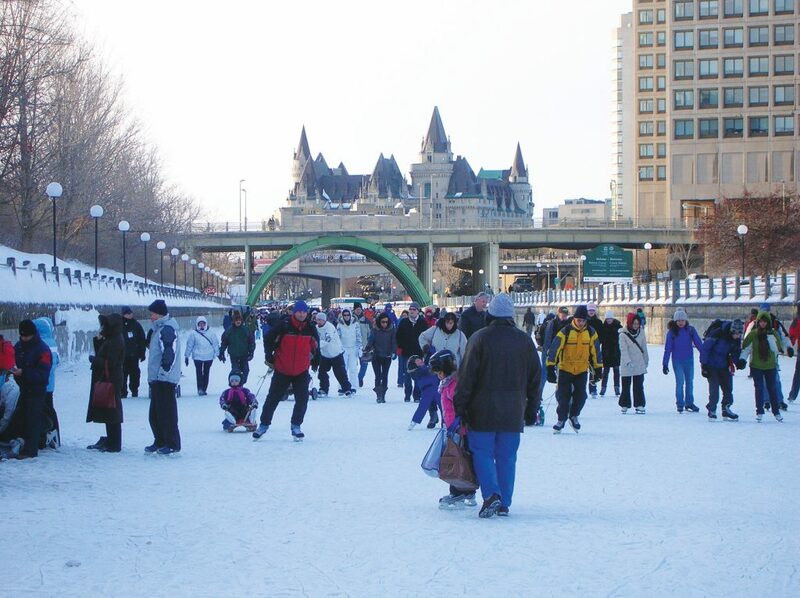 The frozen canal is the starting point for the Winterlude Triathlon that includes an eight-kilometre skate, five-kilometre ski and a five-kilometre run. And Dows Lake is the location of the annual charity Bed Race. In this event, teams of local police officers, firefighters, college students and business and community organizations skate around the course pushing a hilarious variety of beds in a fun competition to raise money for children’s programs such as encouraging children to be better readers. The beds have to be a certain size and mounted on wheels, but apart from that the variations are limited only by the imagination. Prizes are awarded for the fastest team, the most funds raised and, of course, for the best-decorated bed. The Winterlude entertainment is also a major attraction. Outdoor stages on the snow-covered lawns of the Parliament Buildings and at various Winterlude venues have hosted Canadian musicians like Juno award winner Colin James and his band, Murray McLauchlan and Métis singer and Canadian Idol finalist Sherry St. Germain. Day and night, thousands of people, bundled up in warm winter attire, crowd together like a flock of multi-hued penguins, swaying and singing with the music. Confederation Park, lying between the two bridges that cross the canal in the heart of the city, is the site of the ice carving competition. Starting with blocks of ice standing about eight feet tall, carvers from around the world compete to create amazing icy forms in almost unbelievable detail. 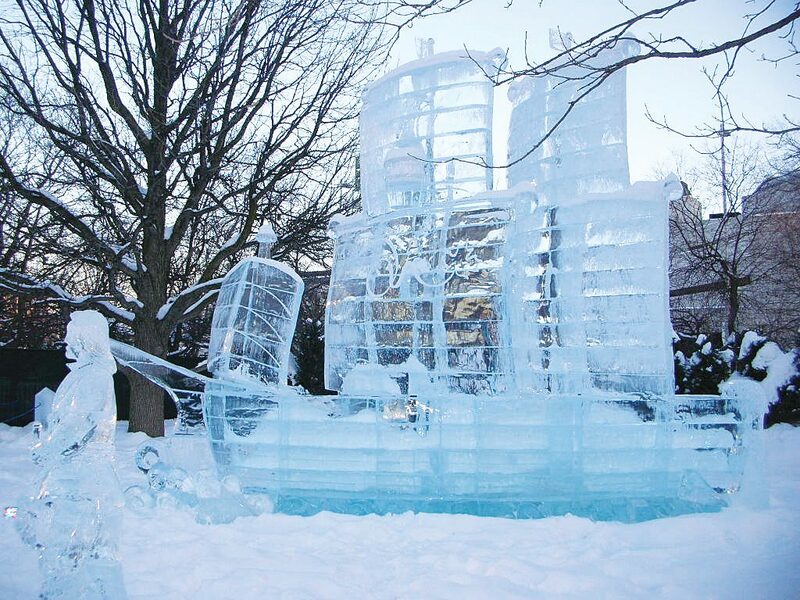 Each year there is a theme, with 2009 being “Living Art.” These temporary works of art have included ice castles and sailing ships as well as serpents, angels and other mystical beings. And in addition to these remarkable works of art, smaller ice carvings adorn the city. You see these three foot high versions placed outside of shops and offices as a constant reminder of the festival. Another popular site is the Snowflake Kingdom at Jacques Cartier Park in Gatineau, across the Ottawa River. This is the home of the Ice Hog family, Winterlude’s friendly, furry mascots, and location of the largest snow playground in North America. 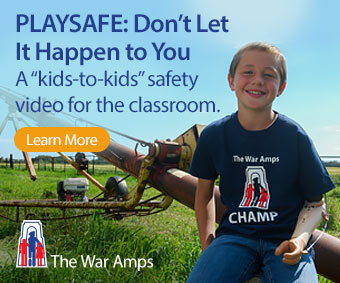 It has giant snow slides and a snow maze to provide fun for kids of all ages. This is also where the National Snow Sculpture Competition takes place. Teams representing the Canadian provinces and territories compete over five days to turn their huge blocks of snow into beautiful artistic creations. You might wonder what the future will be for an event so dependent on the cold in an era of global warming. It’s an issue that is apparently on the mind of the organizers at the National Capital Commission as well. They want to do their part for the planet by tallying up the amount of greenhouse gases that are emitted by events at the Winterlude sites in 2010 and transitioning to a “carbon neutral” Winterlude by 2012. Winterlude takes place from February 5 to 21 this year. If you go, make sure to take warm clothes or plan to purchase the necessary gear when you arrive, as temperatures can drop as low as minus 30 Celsius. And if you don’t want to take your ice skates, you can rent them on the canal by the hour or by the day, or join the many walkers. All of the events at Winterlude are free. 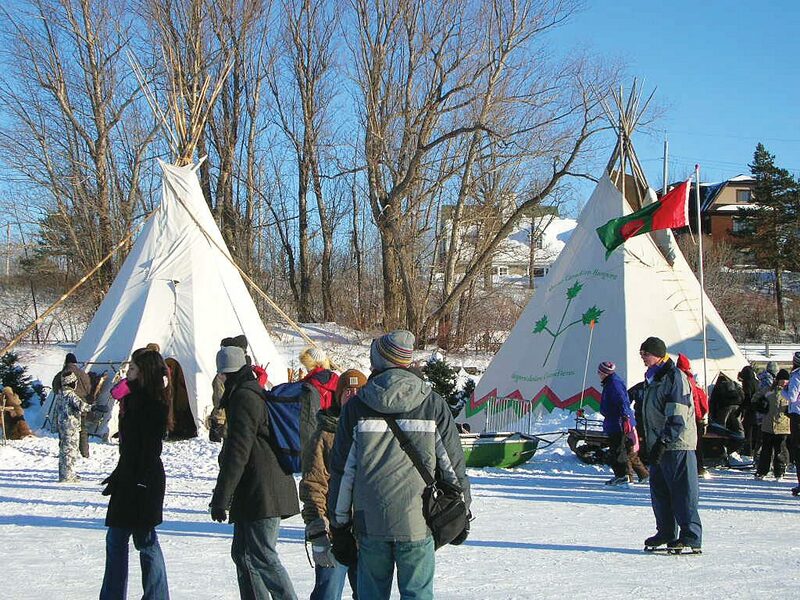 After skating, sliding, learning the essentials of ice fishing or exploring the exhibits of local Aboriginal winter traditions, you will want to warm up. There is plenty to see and do indoors around the National Capital Region, with many of the venues getting into the Winterlude theme. There are lots of good restaurants nearby as well, especially in the Byward Market and along and around Elgin Street. Ottawa is sometimes described as every Canadian’s second home. Come home to Winterlude if you want an authentic Canadian winter experience.